The UCLA Institute of Urologic Oncology (IUO) has one of the largest and most diverse urologic oncology research programs in the nation. The David Geffen School of Medicine at UCLA is ranked third in the U.S. in research dollars and ninth in research funding from the National Institutes of Health (NIH). The UCLA IUO is conducting pioneering basic (bench) research, cutting-edge translational research (bench to bedside) and offering newly-designed clinical trials. Translational research involves moving the knowledge and discovery gained from the basic research done in the lab to its application in clinical settings for the benefit of our patients. 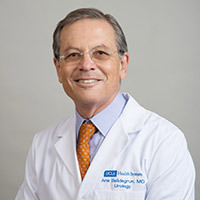 The concept of translational research is often described as "bench-to-bedside" research, and the UCLA Institute of Urologic Oncology is committed to ongoing translational research in a quest to develop new treatments and cures for all urologic oncology patients along with a commitment to educate and train the next generation of leading physician-scientists. The UCLA Institute of Urologic Oncology (IUO) is known for innovation and the most advanced technologies. A leader in immunotherapy and molecular technology, The UCLA IUO spearheads targeted cancer therapy, developing personalized treatments based on the molecular signature of each patient’s cancer. The UCLA IUO is working on a promising new class of targeted therapies for kidney, prostate, and bladder cancers.